In 1769 Prince Abbot Martin Gerbert negotiated with Johann Andreas Silbermann of Strasbourg, from the famous Alsatian-Saxon organ-builder family, to build an organ for the Dome. By 1775 Silbermann had completed his greatest organ with 47 registers. 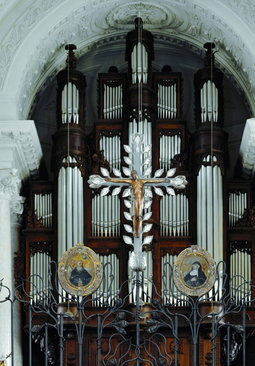 After the dissolution of the monastery in 1806 Grand Duke Karl Friedrich of Baden, as the new owner, donated the Silbermann organ to St. Stephen's Church (Stephanskirche) in Karlsruhe. The organ builder Stiefel dismantled the organ in St. Blasien and reassembled it in Karlsruhe in 1818. During a bombing raid on Karlsruhe, in 1944, the Stephanskirche together with the Silbermann organ were destroyed. 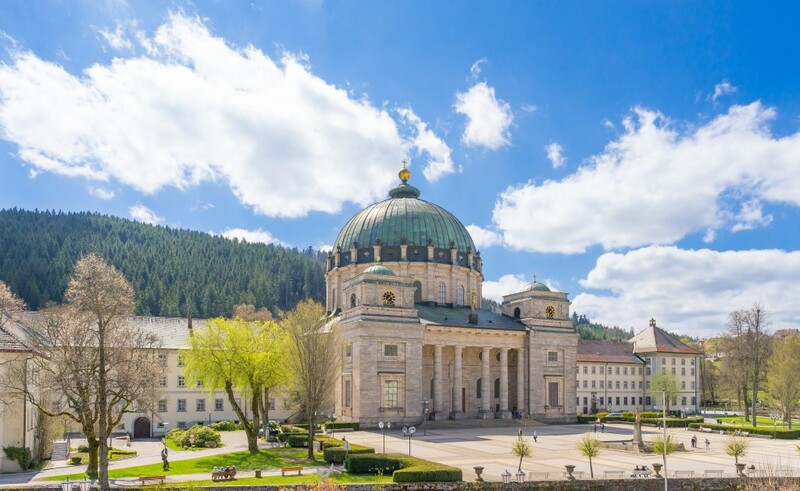 In St. Blasien the domed church - which had become the parish church of the young Catholic congregation, was equipped with a smaller organ. After a fire, an organ was built by the company Louis Durlacher Voit. As part of the major reconstitution from 1907 to 1913 the present organ instrument came into the house of worship. In 1912, the contract was awarded to the organ master-builder Friedrich Wilhelm Schwarz. Louis Schmieder from Karlsruhe took part in the reconstruction of the organ. The new case is reminiscent of the earlier Silbermann organ. The disposition was from Father Kramer Suitbert OSB from the Beuron Monastery. It ressembled the French Alsatian-style organ. The case was made of oak wood by the Metzger brothers from Überlingen. The ornamental components such as angels and cherubs are carved from linden wood. The case is 12 meters tall, measuring 7 meters in width and 4 meters in depth. The organ work was installed in a three-story structure. The basement includes the working parts, such as motor and bellow. On the first floor there is the first manual, which is divided into two chests. On the right side the pedal chests are set up. On the second floor the third manual is located in the middle. Another floor up the second manual is installed in the same way. The two manuals are installed in a swell box, which has a Venetian blind at the front in order to vary the volume. In 1914 the master-organ builder Friedrich Wilhelm Schwarz presented the following data on the organ: 55 registers are distributed to 263 auxiliary hoists with 3891 pipes, including 3293 of tin, 300 of zinc and 293 made of wood. The longest pipe is 620 centimeters, the shortest 17 centimeters. In 1912 the pieces of the organ were transported by five railway carriages from Überlingen to Titisee, overall a mass of 26 tons of material. 15 carts were used to facilitate the transport from Titisee to St. Blasien. The organ underwent several changes in the course of time, among other things, a new console was mounted on the side of the organ. During the monastery fire on 27 May 1977, the organ narrowly escaped destruction. However, fire water penetrated through the back of the monastic choir into the instrument,which required an extensive degree of restoration. The Land of Baden-Wuerttemberg commissioned the organ workshop Klais in Cologne with the repair. All pieces to be substituted were replaced by the same materials, the small bellows were replaced, the metal pipes were washed as well as the dented pipes were planished. A new console had also to be installed. This repair took several years, so that the rededication could only be celebrated on 19 October 1987.